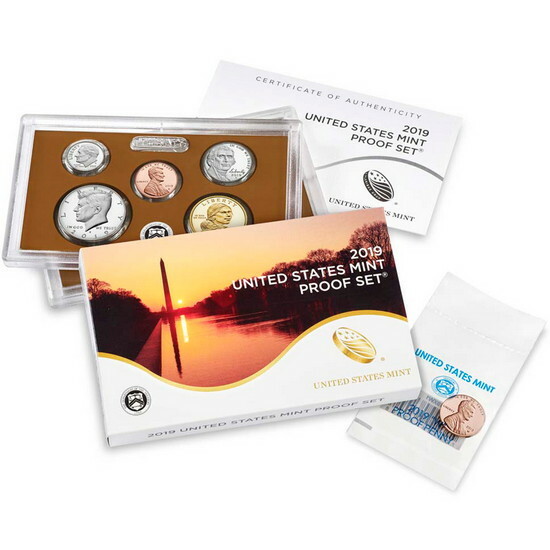 This set contains 11 2019-dated coins in proof quality. 10 coins are protectively encased in two clear plastic lenses and newly designed packaging. United States Mint proof coins feature sharp relief and a mirror-like background. Their frosted, sculpted foregrounds give them a special cameo effect. Proof blanks are specially treated, polished, and cleaned to ensure high quality strikes. The blanks are then fed into presses fitted with specially polished dies and struck at least twice to ensure sharp relief. The coins are then packaged in a protective lens to showcase and maintain their exceptional finish. The remaining single coin, making the total 11 coins, is the Premium, special edition 2019 Lincoln penny with a proof finish struck at the West Point Mint with a "W" mint-mark packaged separately in clear US Mint plastic wrap (the first of 3 sets to be released in 2019 which includes a special edition penny). Each coin in the quarter series features a common obverse (heads) with the 1932 portrait of George Washington by John Flanagan, restored to bring out subtle details and the beauty of the original model. Inscriptions are UNITED STATES OF AMERICA, LIBERTY, IN GOD WE TRUST and QUARTER DOLLAR. There are no design changes to the half-dollar, dime, nickel, or penny.